Hey guys, I'm out shopping for a slip on Lake Coeur d Alene and I've ran into a very significant difference in price. Covered is $2000-2500ish for the season. Couple of different marinas so price varies; or uncovered you're looking $600-1300! Now I know the benefit of the interior with a covered but what about the whole picture? Enjoyment for family/friends, price/benefit, experience and advice is great! Thanks guys! if you're interested in saving some bucks. Maybe get a swim platform cover too. Get a good cover, like Evolution, and don't worry about a covered slip. That's a big difference in price and will pay for the Evolution on the first year (if you plan to do this year after year). +1. That's my plan too if we end up getting a slip. Something about the reflection off the water that could dull your boat. I have heard this many times, but I am sure it could turn into a debate. in general, sunlight, heat, rain and other stuff that falls from the sky is harmful to gelcoat, vinyl, plastics and carpet. a good boat cover will do well. i suspect a covered slip will do better. If it was me i'd get the covered slip. I've never used a covered slip before. Always just had a descent cover & waterproofed it well. Seems like you usually see tons more spiders & webs under the covered slips. Plus their hotter than Hades under those tarped covers in the summer. Also, a covered slip suggests 110v power may be avail, where rarely avail in uncovered setups.... Signif consideration for me. If I could swing it I am going covered. With that said I would also know I would be covering the boat in a covered slip also. Mother nature is beautiful but not forgiving. My boat resides under a covered canopy, and I crank it pretty tight up under there when I leave. But there is always a film of dust/pollen and some bug crap on it when I come back to it a week later. A covered slip probably has a whole lot more head room and will allow that much more stuff to fall on it. So if the OP goes covered, he should plan on a quick wipe down each time he arrives (which is no big deal, but still something to be aware of). The best route would be the covered slip AND a good boat cover. Since it won't have to shed much water, at least some kind of cover that won't blow off easily. no sun, no heat, no rain, no bugs no nuthin but a nice clean ready to go boat. Covered with power and a dock box. We love our end slip that has a wider area on one side & only gets evening sun. Being on the end we have our own deck space that we can keep our cart/coolers on without getting in other people's way or use to hang out on when we're not out on the boat. It's our lake property until we can buy some actual lake property. Covered slip for sure. Worth the price to me. We love ours (covered lift, but same concept). Tons of protection of the boat, tons of time saved from not needing to cover the boat all the time. Easy in and out when a quick storm pops up. We still cover it for extended periods of time (more than a few days), so you will still need a good cover for your boat. Thanks guys, kind of my thoughts too. Power is a must and is definitely a deal breaker. Concerns I've heard with covered is definitely the bugs and spiders, it's hotter than hell (the covers aren't a full "roof" system, more of a translucent material), and if the girlfriend and her friends want to go sit on the boat and have some drinks and tan they have to take the boat out. This year I sprayed a mix of peppermint oil, vinegar & lemon dish washing soap all around my slip and up in the rafters. So far the spiders are staying away. I can give a better review of the spray later in the season. I like the shade...if we are hunting sun then we have the option of taking the boat out. In an uncovered slip you don't have the option. We've spent a few afternoons just waiting the rain out too. Instead of getting rained out we can chill in the dry and not have to fully cover the boat back up if we don't want to. This is a great point, I forgot about that! Sitting on a boat lift in the rain sounds really boring, but we've had some great times doing that. It is soooo relaxing. And although you are bummed about not riding, you are still hanging out and having fun, listening to the radio, having a few beers, etc. And, you can give the interior a once over with some wax and 303 and not feel like you are missing out on ride time. 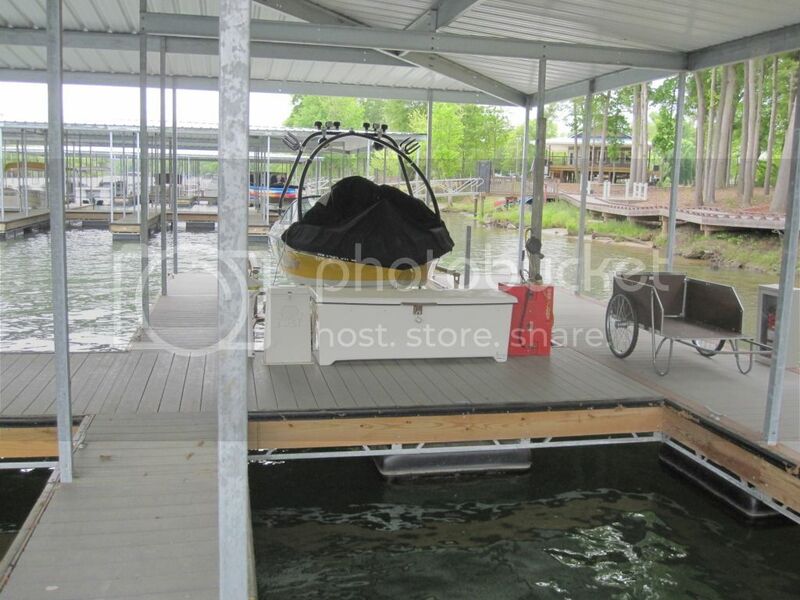 If I posted a picture of how our boat is kept in front of our lake place my preference would be pretty obvious. I am on board with the cover slip with a nice cover. Once you get a covered slip, you'll never go back. I assumed you were keeping your boat out at the resort or Silver Marina where those tarped covered slips are located. They look neat in the pictures, but I think it's the kind of covered slip that needs to be experienced. It's hot under them & if it's raining, not many people are hanging out under them. If they looked like the pic that Moto showed, I'd be all over them too. Plus the old covered slips down at Conkling leave a bit to be desired too. Tons of spiders & wharf rats living inside the docks. But the Derailers are good! You got it! Those detailed always get you! Glad you chimed in, forgot you were in the area it would be down at the yacht club by cedars uncovered but those are the covered ones I've inquired about at silver beach. What're your thoughts? The ones moto showed are top notch! Nice times out of ten the bimini is more than enough shade for us. So having experience up here (far more experience owning a boat up here than myself) you vote........uncovered, nice boat cover, shore power and bimini? Yep, I do. Especially if your girlfriend & her friends aren't comfortable taking the boat in & out of the slip by themselves. I vote covered. I pay extra right now for covered storage. I also keep my boat really clean during the summer and don't like putting it away wet.